Shelly Fussell is an Education Assistant who discovered a love of working with children late in life. A new start in education gave her a renewed interest in literacy, and encouraging children to not only be aware of their environment, but kind and thoughtful toward the creatures that live in it. Our natural environment has never needed our voices to be heard more than now. She is a keen gardener and has a head full of creativity, with many projects completed in and around her home. The publication of Carmichael’s Journey is a dream come true and she hopes publishers will be beating down her door to print her other books! She has several more written and many more in her head. After living in various places across Australia, Shelly now lives in Southeast Queensland with her husband, their daughter and several furred and feathered pets. You can share her publishing journey and love of our native fauna on her Facebook page Shelly Fussell Author. 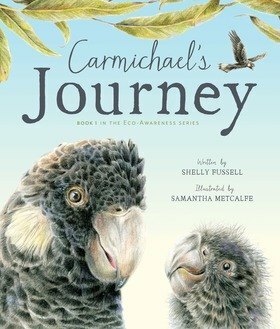 In case you haven't heard the news, Sam's first book 'Carmichael's Journey' has been nominated for the CBCA new illustrators award!